El trabajo de desarrollo de este tanque comenzó en febrero de 1945. Desde la primavera de 1946 hasta finales del año, cuatro prototipos se pusieron a prueba. Nunca se produjo en serie. The T32 is, compared to the earlier T29, a more balanced tank. Combining the still heavily-armored turret with more adequate hull armor, decent mobility, and a sleeker body, it is a tank that better controls what the enemy targets on it. 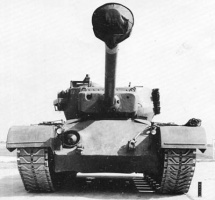 Compared to other tanks of its tier, the T32's main weakness is the 105mm T5E1. Against the tier X tanks which the T32 faces (and the T29 avoided) as well as some tier VIII and IX tanks, it lacks high penetrating power and thus this heavy tank can on occasion struggle in frontal engagements. The T32 excels when paired with or against medium and light tanks as either a hunter or a supporter for flanking and pushes, or against heavy tanks as a defensive bunker in primary lanes to slow pushes. Improved armor thickness over the T29 allows for a few bounces if angled against lower tier or some equal-tier tanks. As stock, you can't expect much out of a T32. It has the health of a tier 7 as stock, absolutely dismal armor, and had virtually no sloping anywhere on the tank. The 90mm is insufficient at tier 8 and the 105mm cannot be mounted with the stock suspension. Therefore, it is highly recommended to get Enhanced Torsion Bars 5+ t Class. This will allow you to mount the 105mm. After you upgrade the suspension, you may remove it if you wish. This tank is best played in one of two ways: as a aggressive brawler (against mediums or lone heavies) or as a support tank depending on the enemy you are fighting. One on one you want to usually get up close and abuse terrain or poor opponent depression using low profile and depression to hit enemy weakspots while moving diagonally in small amounts between shots to make it hard to hit your commanders hatch. However doing this is ill advised if there is another enemy that can easily flank you or is vastly more maneuverable (unless you can corner them in a area that limits their mobility like a alleyway). You may also play as support with this tank. Let your team take the hits and give them support. If necessary, your health is sufficient to take a few hits for your team so a teammate can live to see another shot. Avoid any opportunity to give your opponents a shot at your hull except for trackwheel baiting shots or sidescraping, and you will do well. The gun, engine and radio carry over from the T29 and should be mounted right away. Research the suspension first, you will not be able to mount the 105mm without it.